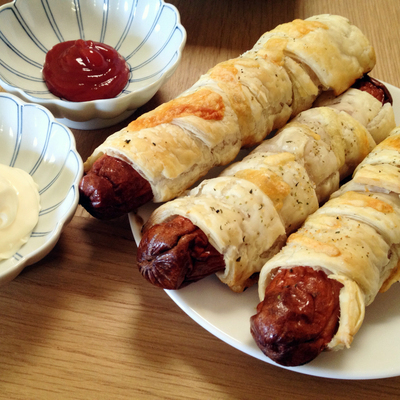 Sometimes your average hot dogs can get a little boring. But puff pastry will always be popular with kids and adults alike. Adding an extra crunch to your usual hotdogs, this is a great recipe for kid's lunch boxes or substitute cocktail frankfurts for a great finger food idea for birthday parties. Preheat the oven to 180°C, grease and line a baking tray. Place a sheet of puff pastry on a clean surface. Using a fork, prick holes in the pastry. Cut the pastry into approximately 3 centimetre wide strips (You will end up with 6 strips per sheet). Place a strip of puff pastry diagonally on your work surface. Then place a frankfurt sideways on top of the pastry strip so that it makes the number ‘7’. Gently wrap the pastry tightly around the frankfurt, overlapping slightly where necessary. Place the hot dogs in the prepared tray. Season with mixed herbs and sprinkle with cheese. Bake for 15 minutes or until pastry is golden and puffed. Serve warm with your favourite sauces or mayonnaise. Where is the best brunch in Melbourne?